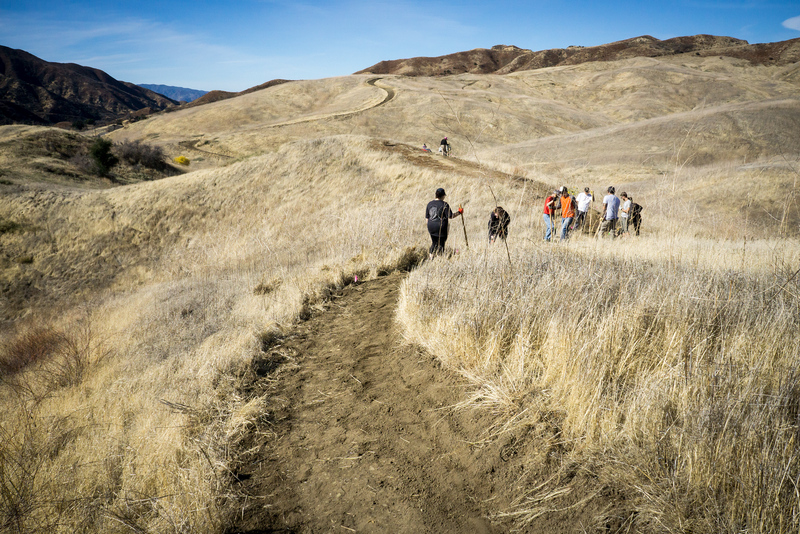 This past Saturday, December 1st, CORBA’s Santa Clarita Valley Trail Users committee (SCVTU) organized another volunteer trail building day at Golden Valley Ranch Open Space in the City of Santa Clarita. 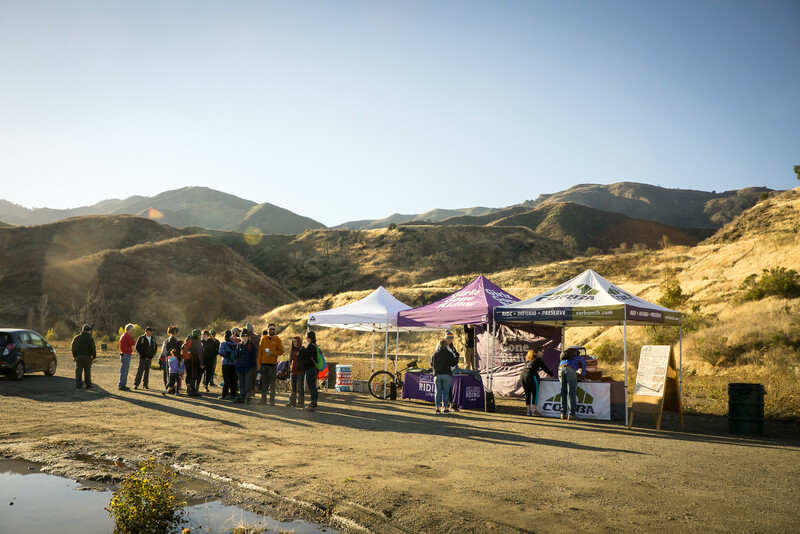 The SCVTU has been working with the City of Santa Clarita to provide new trail opportunities on former ranch properties. Both East Walker Ranch and Golden Valley Ranch were acquired by the City to both limit future development of the area, and to provide a recreational open-space resource for the Santa Clarita Community. 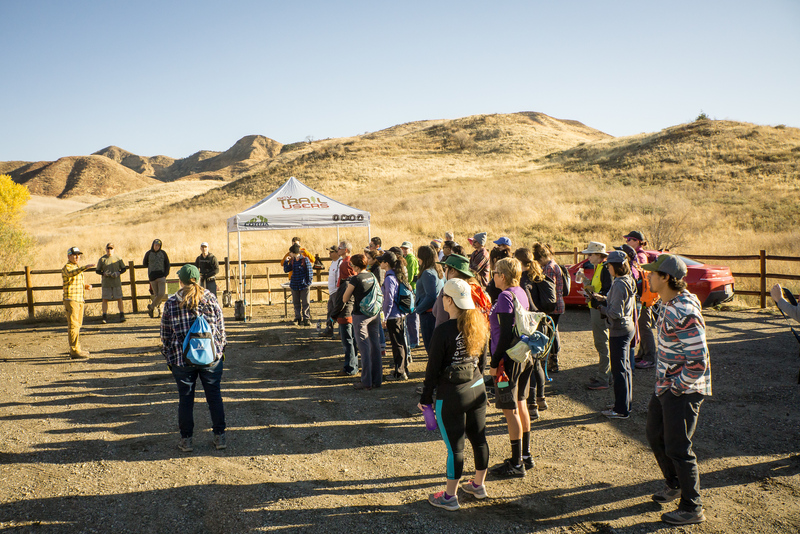 Earlier this year, the group completed approximately three miles of new trail at East Walker Ranch, which was used for last summer’s PedalFest mountain bike race series. The new trail being constructed will link East Walker Ranch to the southern neighborhoods of Santa Clarita around Fair Oaks. It will provide trail connectivity from the City’s neighborhoods to these open space areas, and eventually into the Angeles National Forest. The trail will be a much more enjoyable experience than some of the steep ridge line ranch roads that currently exist. Earlier this year, REI awarded CORBA a $15,000 grant to help lead the new trail development. The grant is being utilized by SCVTU to purchase trailwork tools, materials, volunteer support, and professional contractor services where they are indicated. 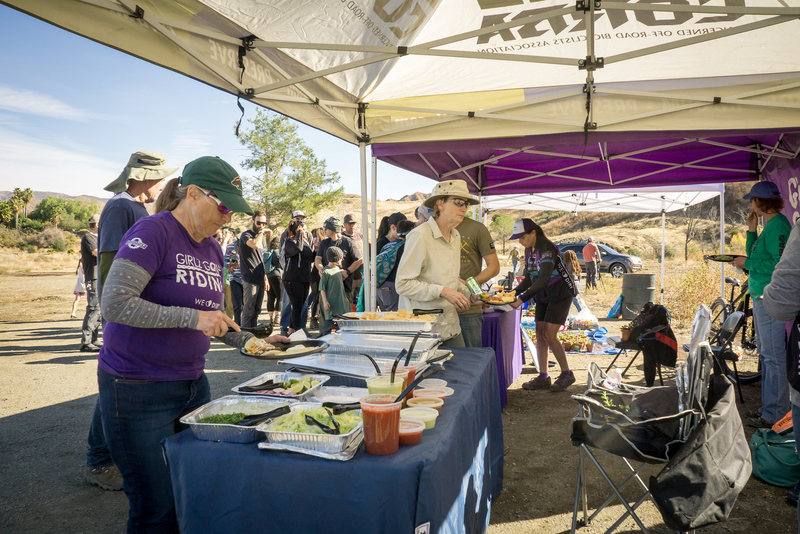 Not only did REI provide financial support, but last Saturday, REI Woodland Hills invited all their employees to join in on the effort. REI chose this project for their “employee community service day.” Some REI folks brought out their entire family. Kids too young to be out on the trail helped pot native succulent plants which were given to volunteers as “thank-you” gift at the end of the day. Girlz Gone Riding (GGR), a women’s mountain bike club supported by CORBA, sent about 18 women to put in work on the trail. The girls had a lot of fun. A common theme to the comments was how rewarding it is to help bring a brand new trail to life. Jose Gonzales, SCVTU’s trail guru, had spent several days over the last few weeks working with Jason Lindenberg to lay out and flag the new trail, along with some preliminary brush clearing. About 60 people came out to the event, staged at East Walker Ranch. Our target for the day was to complete bench-cutting and clearing about a half mile of trail. With the enthusiasm and energy of the group, we were able to complete close to .7 miles! Rains earlier in the week had softened the ground, making it relatively easy to contour the trail and pack it down. Conditions were just about ideal for building new trail in this terrain. However, the sticky clay will not be friendly to hiking boots or tires, and the new trail should be avoided when wet. The Santa Clarita Valley Signal came out to cover the event. The City is also very excited about the project. We appreciate the enthusiasm of all the volunteers. REI Woodland Hills Store Manager Nikki said they had so much fun, they’re ready to come back in January and help finish building the trail. We expect there to be at least two more workdays to finish this trail segment, after which it will be opened to the public. Watch for announcements of upcoming trailwork opportunities. At a recent meeting of the Burbank Trails Committee, City Officials notified us that illegal features that have been built along Preston Ridge in the Verdugo Mountains must be removed. The features have appeared over the past year or two. Near the top of the Vital Link trail (a hiker-only trail), there is a small wooden feature. Beyond that, there are some small tabletop jumps and bermed turns. The City is giving the builders until the end of May to remove the features and the materials used before they go in and take them out. “Preston Ridge is not an official trail” according to the City representative. However, the trail was created by hikers hiking across firebreaks along the ridge line more than two decades ago. One Committee member has hiked there “his whole life.” The City is in a dilemma as to what to do with the “trail” itself, as it has such a long use history, but has never been through any process to become an official trail. The City Attorney has determined that the features themselves are a liability. The work on the ridge is that of many different people and groups. The City has been in contact with some of the builders, but they are only responsible for a small portion of what has been constructed. Many of the recently altered sections of the trail were not done “up to safe, sustainable standards” and did not follow the original line of the existing unofficial but long-used trails along the ridge. Meanwhile, CORBA has submitted a draft proposal to construct a new section of trail with mountain-bike specific features. The City Attorney and others are going over the proposal in detail, but have not yet accepted or denied the proposal. They have expressed hope that it can eventually be accepted and completed. The City needs more time to study the proposal and has requested information and examples of how other cities around the country have dealt with new mountain-bike enhanced trails. Currently most single track trails in Burbank open space are closed to bicycles. There has not been a new official trail constructed since 1998 when the Vital Link trail was completed.